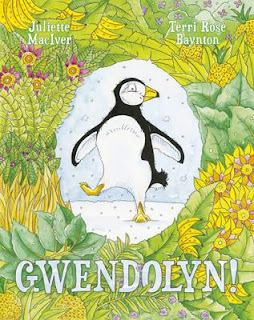 Gwendolyn the penguin lives in the jungle and loves the humidity, the glorious flowers and her friends. She spends much of her time encouraging her friends to acknowledge the best of themselves and their surroundings. So what if Monkey’s bananas are freckled with spots? In Antarctica, Gwendolyn tells Monkey, penguins often go for days or even weeks without food. Her friend Jaguar says it’s too hot to hunt for food. Gwendolyn tells Jaguar to look on the bright side – Antarctica is all snow and ice and freezing! At least in the jungle it’s hot and sunshiny. But when Gwendolyn is asked by Parrot if she has ever been to Antarctica, she realises what she has missed and sets herself on a journey to not only find her way to Antarctica, but to find her own identity. MacIver deals with themes of friendship and identity within the overriding theme of positivity, which young children will certainly understand and begin to appreciate. The ending is satisfying, with Gwendolyn feeling like a ‘real’ penguin, yet choosing to return to the jungle – her true home. With detailed illustrations by Terri Rose Baynton, this will be a lovely picture book to share – whether one to one or with a class. It could initiate good discussion about belonging, being positive and proactive – certainly issues to introduce at an early age to promote resilience. Appropriate for ages 3-6 years.